Every university has an army of supporters, its ex-students, who often remain underutilized while promoting the institution at various forums. We call them the alumni of the university or the institute. We may have thousands of students, hundreds of professors and researchers, and non-teaching staff too in great numbers. But the number of alumni will always be much larger. My college IIT Kharagpur that was established in 1951 and the first batch passed out in 1955 have about 61,000 alumni as of today. Alumni are the only permanent community for any institution. I was a student from 1974 to 1079, just five years but I am an alumnus since 1979 that means for last 38 years and I shall remain an alumnus till I die. Professors and administrators will also retire or go elsewhere. But alumni status is lifelong. My experience tells me that 90% of the universities fail to engage their alumni effectively to enhance the institution’s reputation. The reputation of the university or the institution is not only important for the current students, staff and those who are teaching there but also for the alumni. Connection to a highly ranked institution enhances professional stature and even employability of the alumni. This also offers professional prestige among family, friends, co-workers and employers. I am sure all IITians, IIMites and others from good colleges like BITS, Symbiosis, VIT, ISB etc. feel happy while flashing their status as alumni of those prestigious institutions. I am sure you will agree with me that the value of your degree also increases as your university’s reputation and stature increases. Alumni are usually judged at the first instance according to their alma mater’s current reputation. Even if your university was not very well-known or highly-ranked when you completed your degree, you are bound to be effected to some extent if its current reputation goes up and similarly if the reputation of the university goes down, its alumni do feel bad. Recently I met some very senior ex JNU students and they were feeling very bad after some incidents of anti-national activities were reported in the media. So obviously, it is in the interest of all alumni to continue to serve the interests of your university irrespective of when you passed out from there. Remember that the quality of an alumni network and the academic quality of an institution are two separate things. There are some smaller, less famous universities whose alumni are highly active, and very supportive and helpful in increasing reputation of their university gradually. Universities, irrespective of their current ranking therefore should go all out to harness their alumni as allies to improve their public perception and reputation and thereby their rankings at national and global levels. There are many ways in which alumni can contribute directly and indirectly but in this article we shall restrict to establishing connect with the alumni and particularly through social media. Since the advent of World Wide Web, searching lost friends and relatives became very easy. The universities and institutions with active alumni cells made very good use of these facilities, searched their lost alumni and started building up their databases with current contact coordinates of their alumni world over. The advent of social media tools like Facebook, LinkedIn, Twitter, WhatsApp, Instagrametc gave further boost to alumni connect. The smartphone equipped with WhatsApp brought the biggest revolution to instant connectivity with the possibility of sending text, voice and video to any part of the world. The facility of ‘one too one’ and ‘one too many’ is a great feature. My judgement is that WhatsApp has become the most important tool for connectivity today. While you can still use traditional methods like phone calls and direct mail to communicate with alumni, but your university/college/institution must formulate a comprehensive social media strategy geared toward developing stronger relationships with its former students. Many of the alumni from most of the colleges particularly the post 2000 batches created social media groups while leaving their college as a way to stay in touch with each other. I have a feeling that most of us belonging to even pre-2000 era also have a WhatsApp group or a Facebook page of batch mates, hall mates or even wing mates or class mates. So the alumni from a college/institution/university may have hundreds and thousands of FB pages or WhatsApp groups or LinkenIn groups among themselves. But if their umbilical chord is not connected with their alma mater, it can’t be justified as a part of the alumni movement. So it is the duty of the alumni cell incharge at the college to scout for the administrators of such groups and connect with the alumni through them as well as directly. Every university or institution that is serious about alumni relations must have a dedicated Alumni Cell. And that cell in addition to many other positions must have a position for ‘Social Media Manager’. One of the KRA for this manager will be scaling of your social media efforts. It is highly essential. So you should know how you are going to measure traffic on it. ROI of your effort is important. Through this approach, you as the Social Media Manager or Executive will be able to assess what worked and what didn’t work. What all you can do on the social media totally depends on your imagination. There is no limit to the exploitation of social media for building up the alumni movement. The basic aim should be to arouse the interest in the minds of alumni by posting something that brings back the nostalgia, the old memories, the old stories that the alumni will cherish. After all, we all have spent the best years of our life at our college or the hostel. A photograph with ‘Then and Now’ of a particular famous spot of the campus can be a great starting point for generating conversations. It could be in the form of a question as to ‘Identify’ the spot. Some may remember, some may not. You will be surprised with the amount of interest generated by such photos. Even the current students and professors will like it a lot. Some old group photographs of some key alumni can be posted from time to time. These could be the cricket team or the hockey team of those days which won some special championships. These things are very minor but very important. Some photo of a group of hostellers that won the General Championship for that year will unearth a lot many memories and anecdotes of that era. Once you know that your alumni are participating on social media in reasonable numbers and they have become happening places, you may like to go for crowd funding also. All universities are always in need of more and more funds. So encourage alumni to participate in crowd funding. If your university hosts yearly alumni meets or some other alumni functions like musical evenings or marathons or guest lectures, you can use a crowd funding platform to encourage participation and raise money. Who knows, you might come across a great donor or find a highly valuable alumni volunteer. Twitter has become very popular to give quick updates and alumni shout outs. Who doesn’t like to be in the limelight? Use Twitter as a platform to sing praises for your alumni. Someone from alumni appeared in a newspaper, just tweet it. If an alumnus recently landed a great job, use Twitter as a congratulation medium. You get to interact with outstanding alumni and also gain a few extra followers in the process. Twitter is a great platform for quick messages and celebratory remarks. Instagram is another platform where the institute can share pictures from time to time to demonstrate the progress of some of the important projects going on at the institute. They say that a picture is worth a thousand words, and in the case of Instagram, a thousand likes. Some alumni may like to pay for a new kitchen or dining tables for their hostel or for the library or student centre. Sharing of pictures through Instagram with your donors and alumni will boost the funding campaign. People like to see tangible results of their fundraising efforts, and an image-based social media site like Instagram can be of great help. WhatsApp Messenger, a freeware and cross-platform instant messaging service for smartphones uses the Internet to make voice calls, one to one video calls, text messages, images, GIF, videos, documents, user location, audio files, phone contacts and voice notes using standard cellular mobile numbers. By February 2016, WhatsApp had a user base of over one billion making it the most popular messaging application globally. WhatsApp is being used widely by the alumni groups. But it has a limitation of having only 256 users in one group. But its versatility and easy to use capability makes it most popular even amongst the pre-2000 era alumni. Social Media Managers can use Whatsapp Broadcast option to increase their reach to any number of alumni. You create a broadcast list of 256 alumni and send a single information to all of them at a time. Thus you can create multiple broadcast lists. So to reach 2500 alumni, you will need ten broadcast lists. However, the receivers will be able to reply only on an individual basis. Another way can be to create multiple groups. To cite an example, we have ten alumni chapters of IIT Kharagpur in India. So we can have ten WhatsApp groups as ‘KGPians@Delhi’, ‘KGPians@Mumbai’, ‘KGPians@Kolkata’, ‘KGPians@Pune’ etc. Then I have a main group of alumni association as ‘KGPFoundation’ group which will have office bearers of the national level body plus the four office bearers from each of the ten alumni chapters. Now ‘KGPians@Pune’ has less than 256 alumni, so there is no problem. But Delhi has about 1200 alumni so we need a minimum of five groups. So we can have one group with alumni from 50s and 60s batches, another one from 70s, one from 80s, one from 90s and so on. Some alumni may be interested to connect based on their professional and academic likings and may like to contribute to their alma mater in the field of their expertise. So Special Interest Groups (SIGs) can be created. Therefore, some of the IIT Kharagpur alumni working in the field of solar energy may like to become part of an SIG titled ‘KGPians4SolarEnergy’. Alumni interested in Nano Technology will become part of the SIG named ‘KGPians4NanoTechnology’. Thus many more SIGs can be created and their members can become mentors for the present students working in those areas. They can guide them for internships, projects, consultancy projects and even placements in the industry. 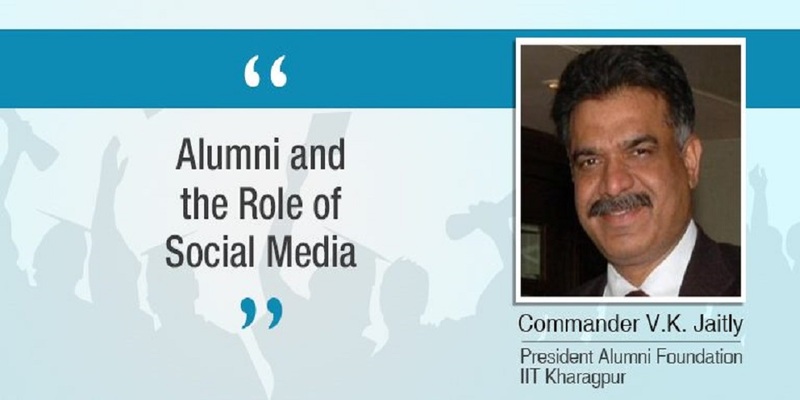 Thus we can see that social media has actually revolutionised the way alumni interact among themselves and with their alma mater. But every college/university must have a dedicated highly expert social media manager as a part of their alumni cell. It is a fact that while there are countless ways to connect with the alumni, using social media has become one of the most cost-effective and easy to use method with an excellent penetration, speed and effectiveness.